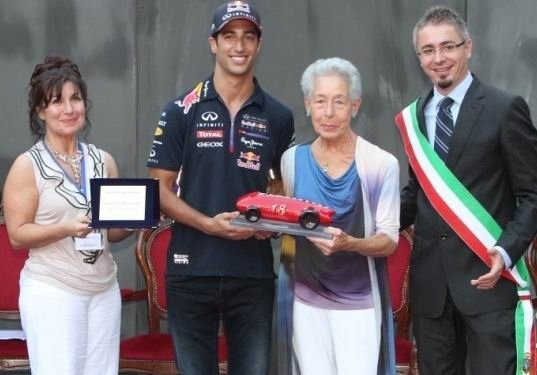 Daniel Ricciardo receives the trophy from Margherita Bandini. Daniel’s three grand prix wins in his first season with Red Bull Racing convinced the judges his name should be the next to feature on the trophy beside such stellar names as Sebastian Vettel, Mark Webber, Robert Kubica, Fernando Alonso, Jacques Villeneuve, David Coulthard and Michael Schumacher. The trophy was named after Lorenzo Bandini, a Ferrari F1 driver in the mid-1960s, whose childhood town was Brisighella, near the famous Imola circuit in Italy, where the presentation took place. ‘I was quite overwhelmed with the reception I received,’ Daniel said. The ceremony itself was a grand occasion. Daniel was greeted by hordes of F1 fans at the town’s main square and also by a band of drummers and trumpeters dressed in medieval costume, as well as knights in chain mail and armour. Bandini, a leading F1 and sports car driver, died in a fiery crash at Monaco in 1967.